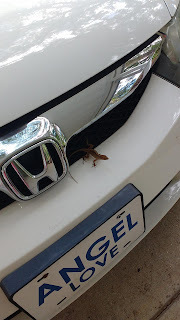 Sometimes when I need to surrender and relax, and let God take the wheel, a little nature messenger will make an unusual appearance to give me a clue. That's what happened last week when Elliot and I stopped in a nearby wooded community to consider a relocation. This little lizard hopped aboard our car and stayed there as we looked around at a possible house. Lizard brings a message to pay attention to dreams. To detach from problems and do what you must. As it turned out, we discovered it was best to stay put in the dream for now. Enjoy your day with the Angels. Have fun paying attention to the birds and animals that come across your path.